Dogsled is a fantastic activity! 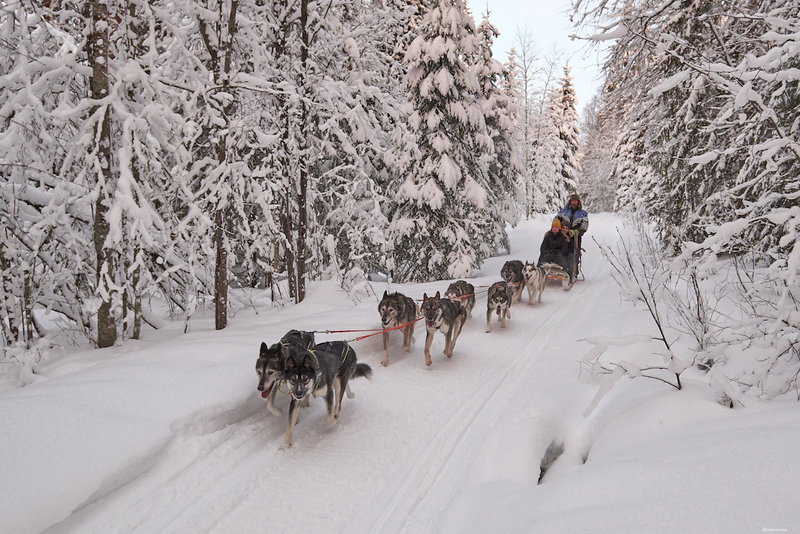 Close to Brändön, just to the north of Luleå is Bothnia Sleddog Adventures. They look forward to taking you on a fantastic adventure in our beautiful winter landscape. You and a partner will learn to take control of a husky team and drive them on a forest and lakes trail. You will take turns with one sitting on the Sled and one driving and periodically swapping places if you like. This is a small family owned kennel and you will of course spend some time with them and their wonderful huskies and appreciate life on the edge of the Luleå archipelago. The experience is 2 hours but allow a little longer. You are sure to leave you with some fantastic memories. Transfers from central Luleå are easily arranged when booking by selection the transfer option and then when completing your personal details you will be asked to advise us your pick up location and contact telephone number. The transfer price is 670 sek per transfer for 1-4 people and the pick up will be 35 minutes before the activity is due to start. If you are more than 4 people please book the tour with-out transfer and contact us to arrange a special transfer. Special 1.5 hour tour drive your own sled tour only 1550 per person. Choose Rate for 1,5 hours. Meet the mushers at their kennel and check if more clothes are needed, and we go out and meet the dogs. There is time to pet and take pictures of the dogs before we put on the harness. We go through instructions and safety before it’s time to take a seat in the sled. The guide takes you on a one hour trip dogsledding. While you leaning back in the sled you have the opportunity to take some pictures of nature. The tour ends with Coffee or tea and a snack in the cottage. Experience the enchantment of Swedish Lapland by night! Take advantage of the long winter darkness to hopefully catch a glimpse of the Northern Lights by snowshoe and feel the power of a Dog-sled team as you race through the forest! This is the complete package to feel what Swedish Lapland is all about. Start with a quiet snowshoe trek with headlamps in the forest. If we are lucky we can catch the Northern Lights before coming back to the cabin for a traditional Swedish meal eaten by the fire. Following dinner, we meet the huskies, take photos and learn sled handling basics and head back out into the night for an amazing ride! Once back at the kennel you continue your experience with a wood fired sauna to warm up while the huskies are put to bed. Once the sauna is over your experience is complete and you can tell your friends that you have experienced the very best of what Swedish Lapland is all about. 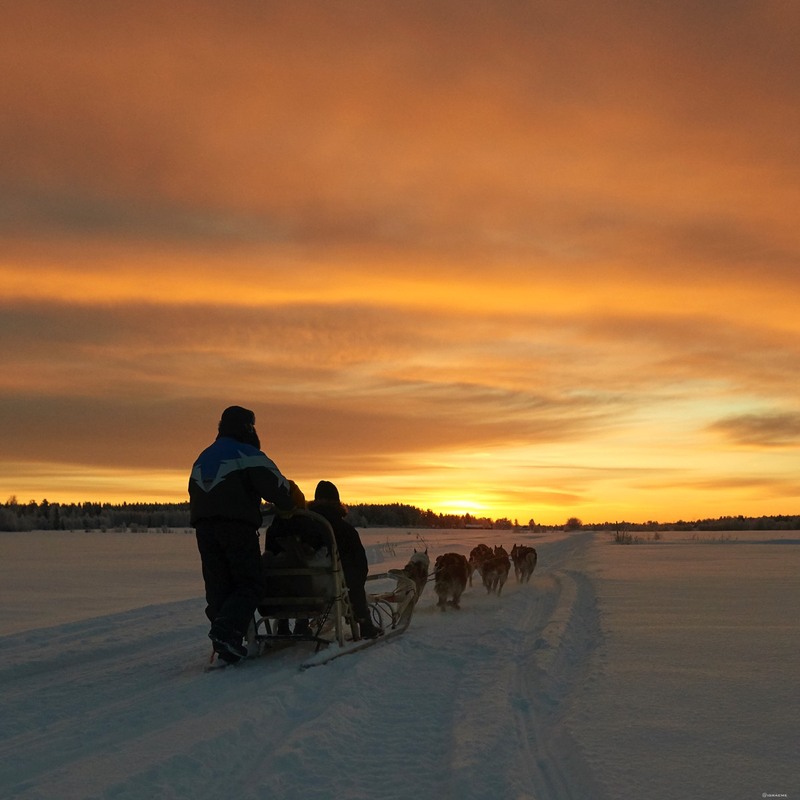 There are several dogsledding experiences in and around Luleå and we have selected the best and ranked them in order of popularity. 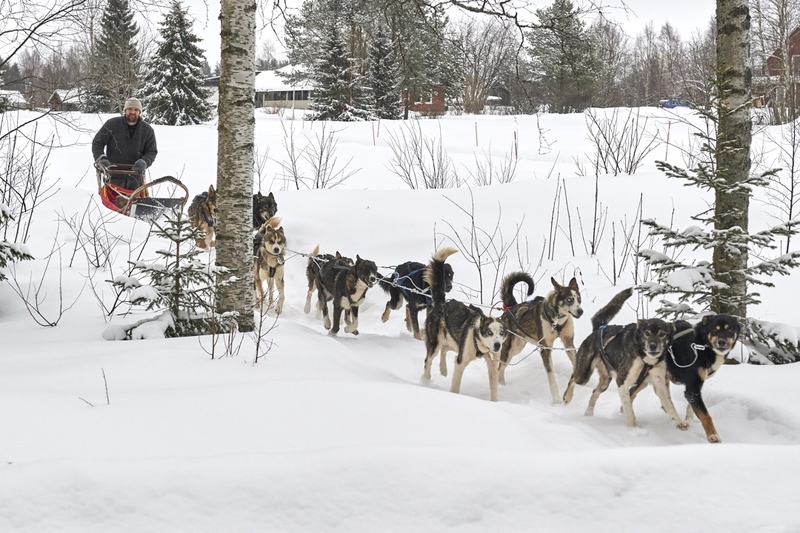 At Luleå Guided Tours we can offer you a wide range of excellent dogsledding adventures and the two below a great examples. Please contact us if you would like more options or more information. The use of dogs and harnesses for transport by native peoples dates back before colonization of the United States. The earliest record of dog sledding dates back to around 1,000 A.D. It is believed that the Inuit people of what we now know as Northern Canada, invented dogsledding to aid in delivering necessary food and supplies. Russian explorers are credited with bringing a new efficiency to dog sledding in the late 1700s. In the beginning of dog sledding, or mushing, just one to three dogs were used to pull small-sized handmade sleds. There was no lead dog, as they ran alongside each other as equals. The Russians began arranging the dogs in pairs and trained a lead dog to take specific commands and keep the rest of the team in line. Dogs were given specific places in line and trained to perform according to their place. In the late nineteenth and early twentieth centuries , the Alaskan Gold Rush brought an increased demand for sled dogs. Anything that needed transport from gold camps and hunting camps during the winter was done so by sled. Sled dogs were bred heavily and in high demand, as many camps and rural cities were accessible only by sled. Today dogsledding has spread around the arctic and has become a fun way to get out and explore the regions nature as well as spend some quality time with mans best friend.